Should employees be punished for sloppy cyber security? Even if it’s innocent, you can spend millions on firewalls and one of your employees can undo that by opening a dodgy email. … One idea would be to encourage employees to be more careful. You could have a system where, if you open two or three of them [phishing emails], you get a reprimand. I think people would comply, particularly if your behavior regarding cyber security was linked to your annual assessment. For bigger companies, one problem is efficiency drives which push companies into insecure behavior, like moving into the cloud or doing BYOD [Bring Your Own Device] before you realize the security implications, because everyone else is doing it. It’s done as a reaction to what other people are doing and done without being integrated into the company’s technology strategy. Apple has unleashed an update of its all-in-one iMac line, which will now come with boosted Wi-Fi and a beefed-up Haswell processor. The iMac is the technological equivalent of the onesie – all-in-one babygros beloved of Bieber and other nubile young boybadours. It contains all the Apple goodness in one package, meaning fanbois can disappear into the iMatrix without having to plug a big ugly monitor into a bigger, uglier box. The latest iMac comes with speedy 802.11ac Wi-Fi and new Intel Haswell processors, which are designed with power conservation in mind and have doubled the battery life of the latest model of the Macbook Air. They are unlikely to have the same effect on the new iMac because – wait for it – there’s no battery. The newbie iMac prices range from £1,149 for the 21.5-incher with a quad-core, 2.7GHz i5 processor with Iris Pro graphics offering “unprecedented levels of integrated graphics performance”. Although this computer is badboy enough for most tasks, for an extra £150, Apple’s 21.5-incher will swap pout the integrated graphics for advanced Nvidia GeForce 700 graphics and a 2.9GHz i5. The 27-inch model should make anyone used to a teeny-tiny 11-inch Macbook Air feel totally inadequate. The model – which will set you back a not-inconsiderable £1,599 – comes with a 3.2GHz quad-core Intel Core i5, NVIDIA GeForce GT 755M and 1GB video memory. For a hefty £1,749, Apple will give you a 27-incher with a 3.4GHz i5, GeForce GTX 775M and 2GB of video memory. All of the iMacs come with 8GB of memory and a 1TB fusion drive, which combines hard disk with superfast flash for the best of both storage worlds. The amended language involving teens – far from getting affirmative express consent from a responsible adult – attempts to “deem” that teenagers “represent” that a parent, who has been given no notice, have consented to give up teens’ private information. This is contrary to the Order and FTC’s recognition that teens are a sensitive group, owed extra privacy protections. Windows 7 is Microsoft’s most secure desktop operating system. But although it stands up well to common security checks, the new OS also comes with its own set of security issues. These weaknesses are both technical flaws and operational concerns. 1. If you’re not running Windows 7 Ultimate or Enterprise editions, then you don’t have access to BitLocker drive-encryption . If this is the case, to protect your systems, you should purchase a drive-encryption product from a third-party vendor like CREDANT, Symantec or WinMagic. 2. You will hit many stumbling blocks if BitLocker is your enterprise drive encryption technology, including the need for manual deployment, lack of audit logging and more. Furthermore, make sure to consider all of your other systems — Windows XP, Mac OS, Linux, etc. — as they’ll need their own drive encryption. 3. Windows 7 systems that are not properly protected are as easy to break into as Windows systems from 10 years ago. “Hope” is not a good strategy when it comes to having computers lost or stolen. 4. If you’ve deployed DirectAccess — Windows 7 and Windows Server 2008 R2’s VPN alternative — then you have to tighten the user restrictions on locking screens. All it takes for someone to gain “direct access” into your network is a careless user leaving his system unattended for a brief moment in a public place. Once a thief walks off with a wide-open laptop, all he has to do is keep the keyboard/mouse active to prevent a screensaver from starting and locking him out. Everything else is fair game. 5. Newer isn’t necessarily better or more secure, and the decision to migrate to Windows 7 on this assumption alone will disappoint. More than 20 security updates have been installed to my Windows 7 system this year. While only a few of these threats are easily-exploited with free tools such as Metasploit, the risk remains. 6. Your desktop security standards documentation needs to be upgraded to incorporate the Windows 7 changes. The Center for Internet Security’s Microsoft Windows 7 Benchmarks are a good place to start. Just remember to do this before your next security assessment or audit. Moving to Windows 7 won’t suddenly make your life as a network administrator any easier and it won’t suddenly reduce business risks. The security issues remain, and if anything, managing a more complex OS makes managing desktop security more complex. Beta Bot targets financial institutions, e-commerce sites, online payment platforms to steal data, financial information. The FBI sent out a warning about an uptick in the use of malware known as Beta Bot that can steal sensitive data such as log-in credentials and financial information. The FBI says Beta Bot blocks computer users’ access to security websites and disables anti-virus programs, leaving computers vulnerable to compromise. Cyber criminals aiming Beta Bot at financial institutions, e-commerce sites, online payment platforms, and social networking. From the FBI: “Beta Bot infection vectors include an illegitimate but official looking Microsoft Windows message box named “User Account Control” that requests a user’s permission to allow the “Windows Command Processor” to modify the user’s computer settings. If the user complies with the request, the hackers are able to infiltrate data from the computer. Beta Bot is also spread via USB thumb drives or online via Skype, where it redirects the user to compromised websites. The FBI recommends running a full system scan with up-to-date anti-virus software on the infected computer. If Beta Bot blocks access to security sites, download the latest anti-virus updates or a whole new anti-virus program onto an uninfected computer, save it to a USB drive and load and run it on the infected computer. It is advisable to subsequently re-format the USB drive to remove any traces of the malware, the FBI stated. RSA’s Limor Kessem, Cybercrime and Online Fraud Communications Specialist, wrote about Beta Bot in May saying: “It appears that a much anticipated event has finally transpired in the cybercrime arena, with the release and active sale of a new commercially-available Trojan family that has begun around January this year, circulating under the name Beta Bot. RSA researchers have recently come across samples of this user-mode rootkit, analyzing its behind-the-scenes infrastructure. Beta Bot actually started out as an HTTP bot and not a banking Trojan, but it has since evolved, donned a trigger list, and was repurposed for financial fraud that includes targets such as banks, ecommerce and even Bitcoin wallets. A panel is reportedly meeting this week to pass new regulations permitting limited use of electronic devices during air travel. The Federal Aviation Administration (FAA) is convening this week to make sweeping changes to a long-debated ban on the use of electronic devices on airplanes during takeoff and landing, the New York Times reports. An advisory panel is gathering this week, where they are expected to agree to permit the use of electronic devices to access content stored on electronic devices, such as e-books, music, podcasts, and videos, anonymous members of the panel told the Times. The ban on using Wi-Fi, email, messaging, and making phone calls will remain intact. The FAA is expected to make the announcement at the end of this month, and will likely put the new rules into place next year, according to the Times. The announcement would be welcome news to frequent flyers, who have endured a long game of cat and mouse with flight attendants who are oddly talented at spotting an active device. The FAA would join the ranks of many air travel systems in Europe and elsewhere, which have introduced technological solutions to allow in-flight use of electronic devices. The release of a brand-new iPhone is an event that would make Thorstein Veblen roll in his gilded, flashy, conspicuous grave. The 5s is a very nice phone, but it contains no features that will immediately change your life, or make your work experience that much more efficient, or enhance your social status beyond that temporary, “Wow, so that’s what a gold one looks like; can I try the fingerprint sensor?” If you need a new phone, then by all means, the 5s is a wonder of engineering and design and you should get one. But it’s not worth spending more than a few hundred dollars on. Here’s why. 1. iOS 7 is half the wow. I know that the new operating system has gotten mixed reviews, but when you’ve mastered its learning curve, I think you’ll conclude, as I have, that the software’s flexibility is its biggest asset. In the past, most complaints about iOS interfaces have centered around their turgidity. A rooted Android phone is still more customizable, but iOS 7 is a lot more customizable than previous iOS versions, and it’s also probably as customizable as any user will need. The out-of-beta Siri really is better, too, and I actually find myself using it. The ad-blocking and tracking-awareness features are useful and comforting in an age of mass surveillance. 2. No effective battery improvement. I know Apple brags that the 5s has a longer battery life, but benchmark testing and use by the experts suggest that the features you are most likely to use if you get a new phone tend to cancel out the extra juice you’d get if the same battery were installed in an old phone. Battery life really is a reason to spend money on a phone, and I don’t think there’s enough of it in the 5s. 3. The 5c is a better buy. Forget about the “it’s plastic, so it’s cheaper” thing. Just buy a tougher case if it bothers you. Beyond that, the 5c is Apple’s Coke Zero/Diet Coke. It is pretty much EXACTLY the same as an iPhone 5, except it’s a little faster, a battery charge lasts a little longer, and the front camera has been improved. If cost is an issue, you’re not missing much. 4. You can play games faster and take better pictures with the 5s, but unless your job or life depend upon those two activities and you’ve been living under a rock for the past three years, you’ve already got a phone that does those things rather well. If you’re a nightlife selfie photographer, then you’ll probably get a kick out of the 5s’s photography enhancements, but why you’d switch from your Lumia 1020 is unclear. Also, if you’re a game-player primarily, you’re probably waiting for the next update to the iPad Mini series. 5. You can’t be a clutz with the 5s. It’s apparently more fragile than previous iPhones. The regular iPhone 5 is hardier than the Samsung Galaxy S4. It’s also a more survivable platform than its newer cousins. As Apple Inc. pitches its newest smartphones, users may find something lacking compared with last year’s model: They could break more easily. SquareTrade says the biggest loser, however, was Samsung’s Galaxy S4, which failed to work after being submerged in water and being dropped 5 feet off the ground. The phone that withstood SquareTrade’s torture test best was Google Inc.’s Moto X. Human is a newcomer in the crowded fitness space, but its take is different. 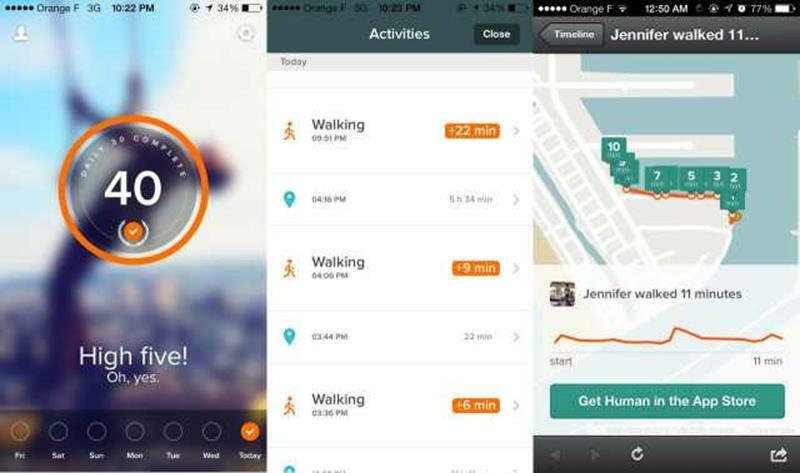 Instead of being a stat-heavy activity app like RunKeeper or a life tracker gadget like Withings, Fitbit or Jawbone, Human is a passive iOS app designed to help you stay healthy. The goal is to move for 30 minutes every day, and to keep up with this simple habit. The company calls it the ‘Daily 30′. As it is extremely simple, keeping up with Human is easier than with competitive fitness systems. “The basic premise of the app is very simple. Human tracks all of your activity and we put the focus on how many minutes you moved today and how many minutes you need to move,” co-founder and CEO Renato Valdés Olmos told me in a phone interview. “Each day of the week that you reach your Daily 30, we send out a push notifications,” he continued. The startup chose to develop a very simple app to appeal to a mass audience, with an emphasis on design. The UI looks great with an ever-changing background picture. Everything is animated, making you want to open the app every time you receive the Daily 30 notification. But the most interesting aspect of Human is the technology behind it. 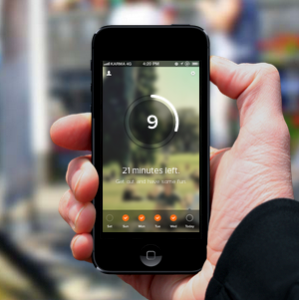 Along with Moves, it is one of the first fitness app to use passive location tracking. You set it up once and forget about it. Then, it calculates your speed with your location and your activity with the accelerometer. But when you launch Human, it doesn’t show you a timeline of your activities. “Showing the user a chronological timeline of your daily activity is great for the first few days. But after a few days, the magic wears out,” Valdés Olmos said. That’s why the app’s depth is hidden behind the big minute count. If you tap on it, you’re taken to the activity timeline. And if you tap on an activity, you will see a map, the duration, distance and average speed. You can share this on Twitter and Facebook as well. In other words, Human automatically tracks your activities like RunKeeper — but you don’t have to remember to launch the app. Over time, the team plans to use all this personal data to improve your daily habits. For example, you can tell the app where your office, your home and your gym are. The service can then build up the basic pattern for user behaviors. “The goal is to send a notification that says ‘get off the subway two stops early and you’ll be on time to work,'” Valdés Olmos said. When it comes to privacy, he was quick to reassure me. “We want to be a different type of company when it comes to data collection,” he said. Users can export and delete everything with a single tap. The startup hasn’t closed its seed round yet, but multiple angels are already committed to invest hundreds of thousands of dollars in total. The app is available to iOS, but an Android version is coming soon. “We want to get as many people as possible to do the Daily 30,” Valdés Olmos said. Amid a bevy of Amazon-related announcements surrounding Kindle – some intentional (the arrival of Kindle MatchBook), some not (news of an updated Kindle Paperwhite leaked a bit early) – Amazon has also quietly launched a new storefront focused on Home Automation products, including things like programmable thermostats, smart locks, sensors, video monitors, and more. The new website aims to centralize the now numerous options involving smart home hardware and services under one roof, organizing products into broad, high-level categories, like “Energy Management,” “Entertainment,” and “Monitoring,” which you can then further drill down into via sub-categories like “Lightbulbs” or “security cameras,” “televisions” or “alarms,” and so on. Additionally, Amazon’s Home Automation store is set up to be newbie-friendly with introductory guides to a variety of product categories like door locks, thermostats, and controllers, for example. There’s even a special section of the storefront that breaks out the “new and innovative” products from companies like Kwikset, Wimoto, SmartThings, and others. 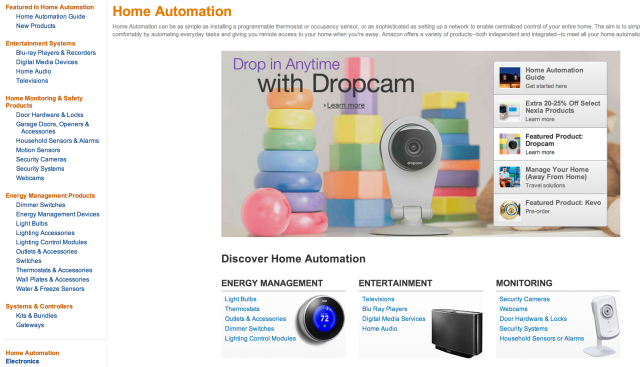 In a rotating banner on the site’s homepage, Kevo, Nexia and Dropcam products are currently given special attention. The automated house and digitally-controllable objects have long been a part of various “home of the future” visions, but is has only been more recently that we’ve begun to see a surge of devices with more mainstream appeal. Earlier home automation products meant complicated setups and larger investments on the part of consumers, but new products have shown that doesn’t always have to be the case. Plus, these devices themselves can add value to the home – not only financial in terms of saving money through smart management of electricity, for instance, but also in the look-and-feel of the home itself. For example, the Nest thermostat showed that home automation hardware can include good design and aesthetic appeal. And Lockitron’s door locks are sleek and modern. Meanwhile things like Dropcam’s video monitoring solution for the home demonstrated that home automation didn’t have to involve a huge setup cost or complexity. The ubiquity of cheaper broadband access, mini computers in the form of smartphones to control our devices, and lowered development and materials costs through crowd-funding and even more receptive VC audiences, have combined to help push the home automation movement forward as of late. Today, tons of internet-of-things companies are finding support via crowd-funding like Piper, Canary, Ube, Beddit, Keen Home, Almond+, or KISI to name a few TechCrunch has covered. And how many smart locks are out there now? A lot. (See, e.g., Lockitron, Poly-Control, August, Goji, Schlage, or Kevo, to name just a few.) Even the big guys like Microsoft, Google and AT&T have been trying their hand in this market, to varying results. Now, Amazon wants in on that action, too, it seems. 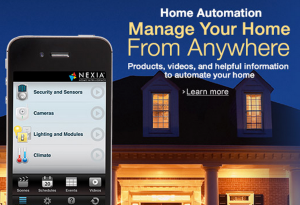 You can check out the new Home Automation Store here on Amazon.com.